Louis Riel and his councillors, circa 1869. Source: University of Manitoba Archives & Special Collections, A13-5. An early carte-de-visite photograph of Métis leader Louis Riel and members of his provisional government and other councillors, likely taken in 1869, recently returned to Winnipeg to be housed at the University of Manitoba Archives & Special Collections. The journey home was tortuous as the photo travelled from North America halfway around the world to Australia and back through auction and multiple dealers to Winnipeg. Considered one of the highest-quality copies of this famous photograph taken by photographer Ryder Larsen, it was part of a larger collection of photographs taken around the Red River settlement by James Penrose and Simon Duffin, among others. The photo returned just as the Federal Court has ruled that 200,000 Métis in Canada are "Indians" under the Constitution Act and fall under federal jurisdiction. This ruling will no doubt be the start of many years of negotiations. Louis Riel arrived just when he is needed. Featured in the photo are: (back row, L-R) Pierre Delorme, Thomas Bunn, François-Xavier Pagé, André Beauchemin; (middle row) John Bruce, Louis Riel, William B. O'Donaghue; (front row) Hugh F. O'Lone, Paul Proulx. 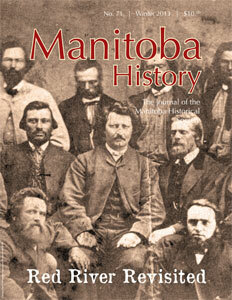 This special issue of Manitoba History contains papers delivered at a symposium organized by the MHS in May 2012 to commemorate the 200th anniversary of the arrival of the Selkirk Settlers at the Red River Settlement. Publication is made possible with the financial support of the Bicentenary of the Red River Selkirk Settlement Committee. Peguis, Woodpeckers, and Myths: What Do We Really Know?